Not all haircuts are built the same. A great haircut makes a man feel like a million bucks! We take pride in your appearance. We want you to look and feel your best! Extra time is always spent to do a detailed and precise haircut. If you don’t really know what you want in a cut, we are happy to advise you on the latest styles and trends. Included in every treatment is complimentary style advice upon request. Your treatment begins with a shampoo, scalp massage and conditioning treatment . 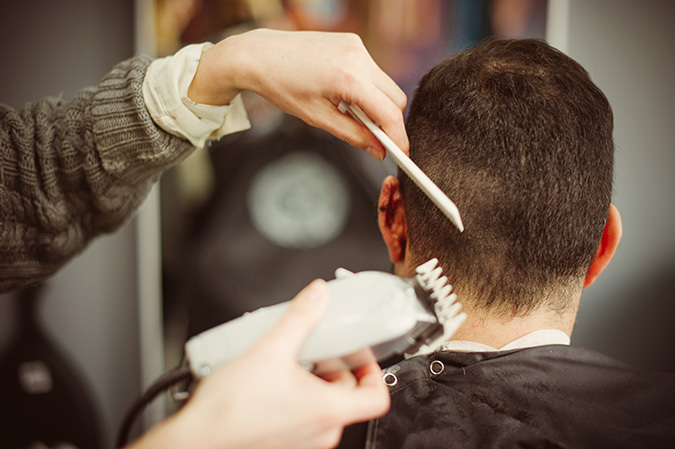 It is our client’s belief that full facial grooming is an important part of a man’s barber experience. So we include this too! A great non-commitment, semi-permanent, wash out color to gently remove or camouflage grey. Fast and easy, no grow-out lines. Color is perfectly matched. Very natural looking results. Try it, you will love it! Why should you consider the grey gone color treatment? Treat yourself to this refreshing grooming/facial experience. This is a facial skin treatment and shave all in one… hot towels, massage, and a clean smooth look…Ear, brow, sideburns and back of neck trim included and finished with shampoo, conditioning and styling. *Please note* we are currently offering safety blade treatment only. The same as the hot razor shave but for your head. Smooth and sleek.